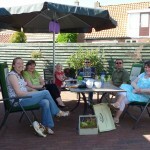 25-Jun-2011: Rein, Deborah, Tessa and Mitchell visited us for a bbq dinner. We had to bbq under the sunscreen to protect us from the rain. 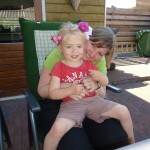 19-Jun-2011: Today we visited Sjoukje’s family in Nijmegen. We took a walk in the Goffert Park and Danique had her nails done for her very first time. 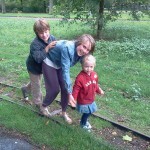 19-Jun-2011 17.27: Jacob, Maria and Danique are forming a train in the Goffert Park in Nijmegen. 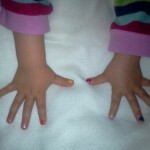 19-Jun-2011: Today Danique got her first nail treatment by Maria. 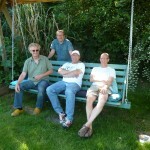 Sa 04-Jun-2011: Today Ronald, Coos, Henne and Ton finally met for a reunion type meeting. 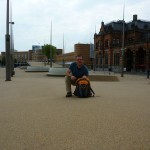 We started having a few drinks at the city center of Groningen (Drie Gezusters). Then we drove to Henne’s new house in Froombosch for a very nice bbq. While Coos and Henne left that evening and went home, Ton stayed overnight. Sa 04-Jun-2011: Henne, Ronald, Coos and Ton at Henne’s place. 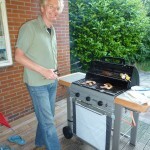 Sa 04-Jun-2011: Henne is preparing a wonderful bbq meal. Su 04-Jun-2011: Ton in front of Groningen Railway station (right) and Hunzehuys (yellow building in the background) where Ton worked for PTT Nederland from 1988-1990.